VANCOUVER, Wash. – Bryan Shull grew up in the shadow of Great Western Malting. Both his grandfather and father made their careers there, and for a time during college he worked there as well. Zane Singleton, left, and Bryan Shull with the tanks at Trap Door Brewing. Shull left Vancouver for a 25-year career in solar energy, but when he returned home in 2013, in part to ponder his second-half life goals, his family’s malting history came back to him: “What if I were to start a brewery?” he wondered. According to the journal, Shull’s company had a 15 percent profit margin in its first two months of operation. In less than six months, the company has more than doubled its kegging capacity, from 80 kegs to 200, with more on the way this spring. Trap Door beer is sold in dozens of taverns, pizzerias and restaurants in Clark, Cowlitz and Skamania counties. By mid-June, Shull expects to have seven full-time employees. 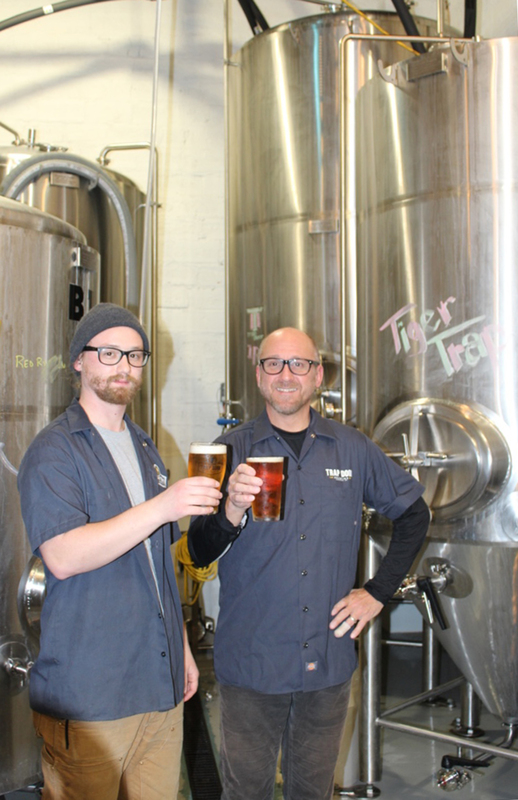 While Shull’s first step toward opening a brewery was taking classes in craft brewing and the business of beer, step two was reaching out to Buck Heidrick, a business advisor with the Washington Small Business Development Centers (SBDC). Heidrick helped him come up with that list, he said, and every time he crossed things off, Heidrick suggested additions. The Washington SBDC (http://wsbdc.org/) is a network of more than two dozen certified business advisors who work with small business owners who want to start, grow or transition a business. The Washington SBDC is supported by Washington State University, the U.S. Small Business Administration and other institutions of higher education and economic development. SBDC advising is one-on-one, confidential and provided at no cost to the client. The business plan Shull wrote with Heidrick’s assistance was so complete and compelling that getting a loan was easier than Shull imagined. He hopes that same business plan, with an ambitious five-year expansion strategy, will help him attract private investors as well. Already his two adult sons have joined him in the enterprise. Zakary Singleton, 24, is a silent investor, but Zane Singleton, 25, is an investor and brew master. Zane graduated from University of California, Davis, in 2015 with a degree in food science and technology. He studied under Charlie Bamforth, a celebrated figure in fermentation science and beer, and was at the top of his class in the top-ranked program, Shull said. “I tried to create a facility that gave Zane every advantage that we could afford,” Shull said. Their brand promise is to not only make exceptional beer, but to make it consistently. Trap Door Brewing (http://trapdoorbrewing.com/), a 15-barrel facility in the Uptown neighborhood of Vancouver, about half a block from where Shull’s father once lived, opened in fall 2015. The century-old building at 2315 Main St., was stripped to the bones and rebuilt to showcase its massive beams and sturdy construction. The brewery offers six different beers, including Trap Door IPA, Trap Door Red and Trap Door Stout.